An Eickhoff CM2H-30 continuous miner is performing well in challenging conditions at Exxaro’s Dorstfontein-West coal mine in South Africa. Having arrived at the mine in 2H16 on a trial basis, the CM2H-30 has “been exceeding its individual targets set by the mine,” according to Eickhoff. Exxaro has now decided to buy the continuous miner. The Dorstfontein mining complex is located 30 km south of eMalahleni in the northern part of the Highveld Coalfield. 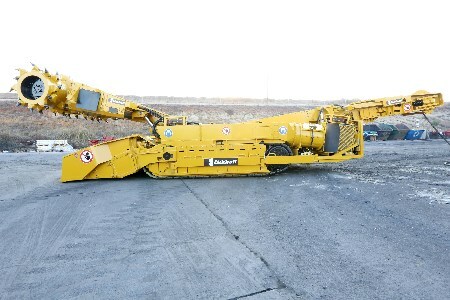 In addition to the underground Dorstfontein-West mine, the company also includes an opencast mine at Dorstrontein-East. Last year Dorstfontein-West mined 0.7 million t of ROM coal from three continuous miner sections and one drill-and-blast section. Exxaro’s total coal production levels stand at about 3.9 million tpy, making it a more player in the South African coal sector. It is also one of the largest exporters of South African coal. In addition to the CM2H-30 at Dorstfontein-West, there are a further fourteen Eickhoff continuous miners active in the South African coal market. Founded in 1864, Eickhoff also manufacturers longwall shearers for the underground coal mining industry.